DNA tests confirm Lebanon is holding the young daughter of Islamic State (IS) leader Abu Bakr al-Baghdadi, the country's interior minister says. 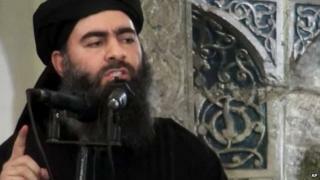 Nohad Machnouk told Lebanon's MTV television that the child's mother, who is also in custody, was now believed to be one of Baghdadi's ex-wives. On Tuesday, Lebanese security officials said they had detained his wife and son at a border crossing with Syria. But Iraq's government later insisted the woman was not married to Baghdadi. It said the woman - identified as Saja al-Dulaimi - was the daughter of an active member of al-Qaeda's affiliate in Syria, al-Nusra Front. She is also thought to have been detained by the Syrian authorities before being freed in March as part of a prisoner exchange with al-Nusra. Late on Wednesday, Mr Machnouk told MTV that Ms Dulaimi had been travelling with two sons and a daughter when they were detained by the army two weeks ago. "Dulaimi is not Abu Bakr al-Baghdadi's wife currently. She has been married three times: first to a man from the former Iraqi regime, with whom she had two sons," he said. The minister added: "We conducted DNA tests on her and the daughter, which showed she was the mother of the girl, and that the girl is [Baghdadi's] daughter, based on DNA from Baghdadi from Iraq." It is not clear how the Iraqi authorities have the IS leader's DNA. However, in 2005 he was arrested by US forces in Iraq and spent the next four years a prisoner at Camp Bucca, near the southern town of Um Qasr, before being handed over to the Iraqi authorities and then released. Mr Machnouk said Ms Dulaimi's children were staying at a care centre while she was being interrogated at the defence ministry's headquarters. IS has not commented on their detention, but al-Nusra has condemned it. One Lebanese official has said it is a "powerful card to apply pressure" in negotiations with IS and al-Nusra, who are holding more than 20 Lebanese soldiers and police hostage. They are threatening to kill them unless militants are freed from Lebanese jails.